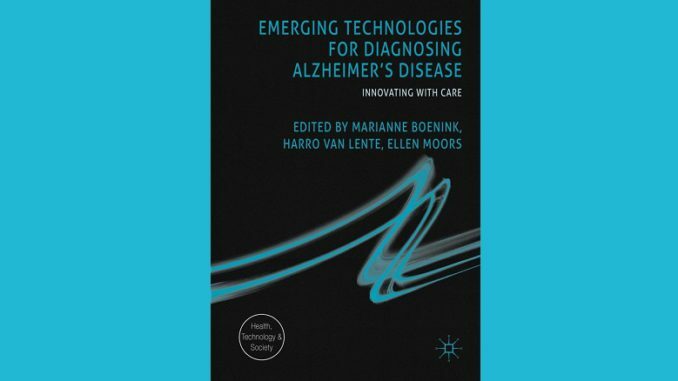 At the 2018 EASST conference in Lancaster, UK, the Chris Freeman Award was given to the book Emerging Technologies for Diagnosing Alzheimer’s Disease: Innovating with Care. The book was edited by Marianne Boenink, Harro van Lente and Ellen Moors, and published by Palgrave MacMillan. In honour of Chris Freeman, this award is given to a publication which is a significant collective contribution to the interaction of science and technology studies with the study of innovation. Selectionis based on the successful development of social approaches to the dynamics of innovation, originality, and better understanding of the pursuit of innovation for societal and environmental goals. This book explores international biomedical research and development on the early diagnosis of Alzheimer’s disease. It offers timely, multidisciplinary reflections on the social and ethical issues raised by promises of early diagnostics and asks under which conditions emerging diagnostic technologies can be considered a responsible innovation. The initial chapters in this edited volume provide an overview and a critical discussion of recent developments in biomedical research on Alzheimer’s disease. Subsequent contributions explore the values at stake in current practices of dealing with Alzheimer’s disease and dementia, both within and outside the biomedical domain. Novel diagnostic technologies for Alzheimer’s disease emerge in a complex and shifting field, full of controversies. Innovating with care requires a precise mapping of how concepts, values and responsibilities are filled in through the confrontation of practices. In doing so, the volume offers a practice-based approach of responsible innovation that is also applicable to other fields of innovation.